Hey guys! Here's some quickposes I did. This is really an awesome site. Definitely going to make a habit out of using this. 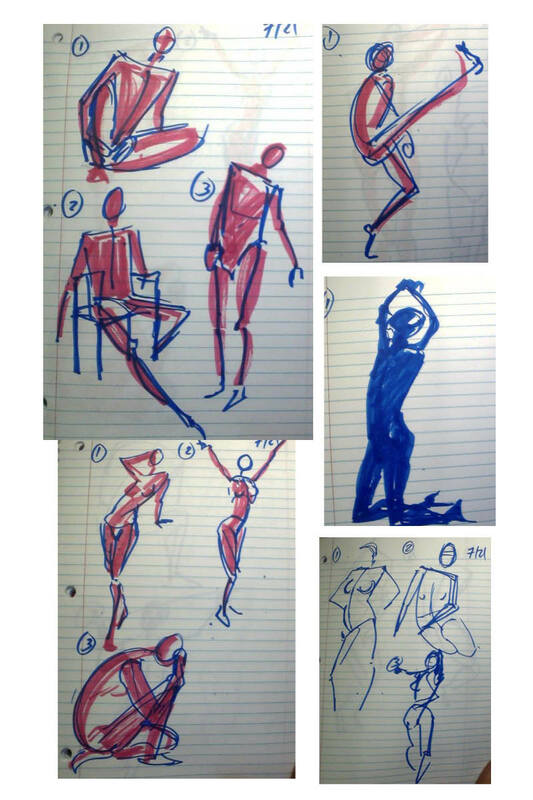 The following are 30 second poses! I'm 10% of the way to getting my certicate for level 1!! Nice work! I look forward for more . Hey guys, some 30s, 120s and then 300s drawings, hope to make this a habit and improve, am learning anatomy on the side too, mostly Vilppu. On 30s drawings its very hard, I take too much time analyzing and imagining myself in the pose, then there is just too little time to put my thoughts on the paper. In 30 seconds you don't have time to do a lot of conscious thinking. With lower time limits it's really about reacting to the action that you're seeing. The effectiveness of that reaction will be determined by your fundamental understanding of drawing and the human figure. So the more skilled you become at the basics the more effective you'll be at capturing the gesture in a short amount of time. Before I get to how I fleshed out this figure, I wanted to ask if there's any glaring problems with my gesture drawings. They're mainly stick figures, but I try to keep the gesture in the figures regardless. I don't really know what else to comment on for the gestures. I just try to capture the movement in the gesture as best I can, and I create three circles for the pelvis, torso, and head, starting with the pelvis first. This is just so I'm able to better draw the limbs, but idk if this restricts the figure at all and makes it less fluid. I tried to flesh out the figure by drawing cylinders for the limbs, and boxes for the pelvis and torso. I'm leaving out the head for now since I've heard I can always just add the head after I've finished the body. I tried to clean it up a bit, but didn't really like how the limbs looked. His right arm seems really flat, and the lines for his legs are really messy, so it's hard to tell what's going on. I also tried to focus more on the negative space between his torso and his right arm, since I heard drawing in negative space can help with positioning and proportions, which I feel it does. It's easier to tell what's going on now, but I still feel like there's things that are off about the body. The pecs look unnatural and the right arm still looks flat. Also, I had a lot of trouble with drawing the cigarette in his left hand, so I just gave up in the middle of drawing it. I still had trouble with drawing the legs too, and I'm not sure why. One thing I think I did right in this step is I drew the chair he's sitting in and the table he's propping his left arm on. Looking back, I should've drew the other chair that's keeping his legs up. I wanted to draw it in when I finalized the piece, but I think it'd be better to do it asap. Thoughts on that? I wanted to add more body fat to the figure, but I don't think it worked out right. The pecs still look unnatural. I think I need to not put so much line weight on the pecs to try and define them. I should try to be more subtle with the lines for the pecs. Thoughts? Also, the legs look better, more defined, but I think the fact that I didn't have the second chair there made it hard for me to judge how far I should draw his legs. The right arm also looks pretty unnatural. Also, I kept the head out throughout all the steps just so I could focus more on the body. It took me a little over 30 minutes to draw all these steps. I wanted to share these steps on this board so I could get some critiques on my process for making a figure, since after I draw a gesture, I really have no idea what to do after that. Also, if possible, I would like some advice on drawing muscles. I've tried drawing each muscle separately before, but I felt that was unnecessary in the end since I just covered it all with skin anyway. Maybe it really is necessary though. I really don't know. Anyway, I'm hoping some of you can critique the process I've got here. I'd really like to draw from imagination in the future, but I feel that drawing from references first is a good place to start. Thoughts on this? I wanted to share these steps on this board so I could get some critiques on my process for making a figure, since after I draw a gesture, I really have no idea what to do after that. As you stated at the end of that sentence, your problem is a lack of knowledge. You need to be knowledgeable about the whole process. Consider studying the anatomy and structure of the figure from some good resources. You should also practice line control, seeing that things got a bit messy after the gesture stage. Focus on developing the very fundamental skills. I'm not sure how I'd go about studying the anatomy and structure of a figure. Isn't that what I'm doing by drawing gestures and attempting to flesh out the figure? Are there certain things I need to be aware of when drawing a figure, like how the muscles connect with each other or the proportions of the figure? Also, I do practice line control, at least, I think I do. I practice superimposing lines like I did at the top of my gesture drawings page. If there's more I can do, let me know. I didn't mean that your method is bad, it's just that you need to acquire more knowledge. The best way being by becoming the student of or being mentored by someone who is good at figure drawing. The proportions of the figure, where the muscles connect and their function are definitely aspects of the figure that you need to understand in order to get the best results. As for your line work, your brush settings might also be playing a role. The drawings got very muddy once you start fleshing them out. You may want to try turning on Shape Dynamics in the brush menu (F5) and setting Minimum Diameter to 0%, Size Jitter to 0% and its Control to Pen Pressure. This will allow you to control the thickness of your lines based on how hard you press with your stylus. I hope this helps . EDIT: I should also mention that the inital gesture was just made with the blue pen, then i went back over each gesture (after the sesion was done) in pink...dunno if i should be doing that but. Just added it randomly. Good work Jyou, please keep posting more! hello! 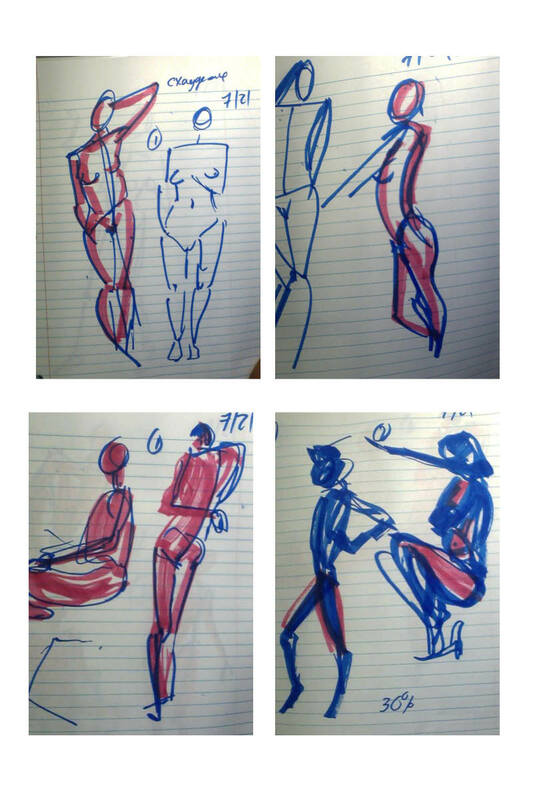 i am just starting out really, these are the second set of 2-minute gesture drawings i did today. i have dyspraxia alongside some serious hand injuries so i am pretty shy about sharing these, especially when i compare mine to others. BUT, i have made a lot of progress since i started drawing seriously about a month ago and was basically just making a mess all over the page lol. hoping to keep improving as long as my hand will let me. Good line quality, you're on the right track. I look forward for more . I hope through this I will get better at drawing from Imagination. Nice work Hannes! I look forward for more . That is great sketches for half a minute! @eezaque Thank you, they were half a minute each and I've been practicing them a lot . Been a while since I've posted any of my gesture practices. I've been studying anatomy lately, and I'm in two figure drawing courses this semester. I was told to draw in one continuous, "flow-y" line when drawing gestures. I did that here and I ended up really enjoying it. May end up posting on a daily basis. Also, fantasyartist, if you're reading this, I have you to think for becoming interested in learning anatomy. After checking it out, I realized there's so much more to art I never knew before, and that I've got so much to learn, but I'm willing to learn as much as I can! I'm glad to hear about your new desire to learn aallen, I look forward to how you will improve .